1. Spring: Go sightseeing to pure white cherry and plum flowers blossoming or yellow kale flowers and involve in festival activities of the locals. Spring is the season of festivals and traditional games such as celebrating old age for grandparents of Tay people, horse or buffalo fighting festivals,,, that appeals visitors and the locals to come and enjoy the festival atmosphere. 2. 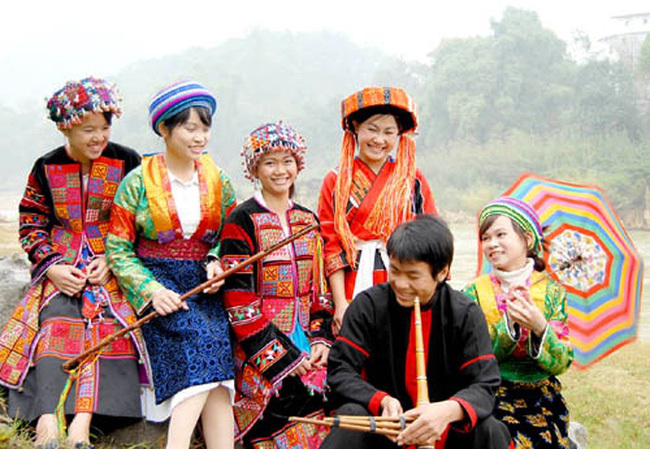 Summer: In April, in Ha Giang, Khau Vai market will take place only once a year which is the cultural trait of H'mong people. The locals will move to the market in colourful clothes, sing and dance at night. Young boys and H'mong girls will date secretly to show their love to each other or couple of wife and husband meet their old lovers to chat and share stories of daily life while the other will respect them. In addition, in May or June, it will be the best time for you to take picture or immerse yourself in beautiful pictures of farm, people start to pump water into their farm to grow rice for a new crop. Although it reflects a daily routine and simple lifestyle of the locals, visitors still feel special to enjoy themselves into this poetic scenery by their own in a peaceful landscape of the north pole of the country. 3. Autumn: Golden rice season. 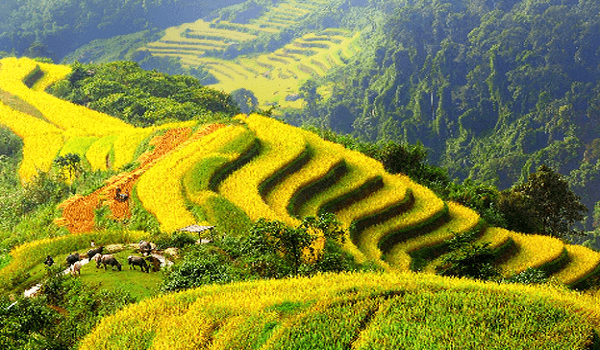 In August and September, which is the harvest season of the locals in Ha Giang. You will have a chance to admire the endless yellow rice fields that seems to stretch to the horizon sky. It is such a spectacular view to fall your mind into the amazing beauty of the nature and scent of ripen rice season floating everywhere. 4. 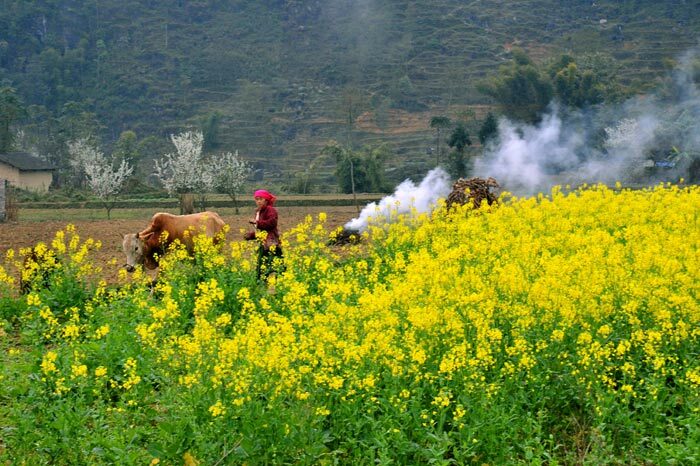 Winter: If you visit Ha Giang during October and November, it will be Tam Giac Mach flowers blossoming season, which is one of the best time all tourists often come here. The light purple and pink of Tam Giac Mach waves in the wind stretching mountainsides, sometimes covers the whole valleys or grows and scatters in small rocks. In Tam Giac Mach season, a lot of young adventurers gather to hunt this flowers, take photos to keep memories of the youth. This flower can charm anyone with its floating poetic beauty and draws a breathtaking scenery for Ha Giang. 1. Lung Cu flag tower: is considered as the high forehead of motherland - where we draw the first point of S map of our Vietnam beautiful country. Tourists had to conquer 286 rock steps to reach the top of the flag tower at nearly 1700 m high. The body of the tower is imprinted with patterns of Dong Son bronze drum and a national flag with the size of 54 m2, representing for 54 ethnic groups of Vietnam. Lung Cu flag tower is a holy symbol of Vietnam freedom and liberation and witnesses many historical events of the country. Viewed from top of Lung Cu flag tower, visitors can observe all the wild beauty of green mountains and nature, immense rice fields and raise the pride of the country experiencing many ups and downs in the past to protect the peace of the country. 2. Dong Van old town: The old town lies in the valley, surrounded by rock plateaus with only 40 small roofs that are more than 100 years. In the morning and afternoon, the brightly yellow sunshine connected with the grey of ancient houses creates a magnificent picture of the old town which was built in early 20th century. At that time, most of Tay, H'mong and Chinese people settled in this area, and later welcomed more other ones. The old town is imprinted with the architecture of Chinese with 2 wooden floors tiled and hung up red lanterns. 3. Ma Pi Leng Pass: is one of top four biggest passes and considered as The Great Wall of Vietnam. It is the most dangerous road with 20 kilometer length, attracts many young adventurers to conquer the pass. Over the Ma Pi Leng, there has a mountain with 2.000 meters height located on the 'Happiness' road connecting Ha Giang, Dong Van and Meo Vac town. Ma Pi Leng began building from the 60s of the 20th century by workers who almost are the H'mong. At the top of Ma Pi Leng mount is the “Happiness” road, there has a stone stele recording the marks and contributions to the construction process. Why should you join the central Vietnam coast cycling tour? Why should you join Hanoi countryside cycling tour?